Pomegranate has been used in Middle Eastern and Indian medicine for many centuries. Scientific interest in the cosmetical properties of this plant sparked only recently, but it is already known as a powerful antioxidant with potential in treating numerous diseases, from diabetes and cardiovascular disease to Alzheimer’s and cancer . Pomegranate extracts are standardized to contain 40 % of ellagic acid. This compound is one of the main antioxidants in pomegranates . On the other hand, retaining a considerable amount of other compounds helps to achieve synergistic effects by combined activity of all the components . Among the other compounds, polysaccharides have many beneficial properties – they are able to neutralize free radicals and even reduce glycation . The latter reaction occurs in patients with diabetes, Alzheimer’s and other diseases, resulting in damaged collagen and other proteins. Coupled with increased collagen synthesis, the anti-glycation effect makes pomegranate very useful for these patients. Of course, as antioxidants, pomegranate compounds are useful for any skin, as they provide protection during UV exposure . Ellagic acid also imparts a strong anti-inflammatory activity on the extract. In mice with dermatitis, both the extract and purified ellagic acid successfully reduced edema – their effect was even stronger than that of reference drugs used . It was also effective in reducing facial reddening (erythema) in human trials . Together with the antioxidant activity, this makes pomegranate extract a desirable ingredient in UV protection. In experiments with human skin, treatment with this extract significantly reduced various types of UV damage . It prevented protein oxidation, DNA damage, and suppressed the synthesis of metalloproteinases – enzymes that are responsible for the decrease in collagen during photoageing. Another study found that this extract reduced UV-induced cell death, inflammatory processes, and even retained cells in an undividing stage, giving them more time to repair DNA damage . Pomegranate extract can also increase collagen levels directly, by increasing its synthesis . Pomegranate extracts are useful for reducing undesired skin darkening. Ellagic acid binds copper, which is necessary for melanin-producing enzymes to act, and thus prevents hyperpigmentation. In human trials, pomegranate extract was found to reduce skin melanin content already after 6 weeks of application . Ellagic acid, especially in form of a plant extract, was also successful in treating patients with melasma (pigmented skin spots arising from hormonal causes) . 0.5 % ellagic acid cream, in combination with salicylic acid, significantly reduces hyperpigmentation and dark spots, and even has better properties than other pharmaceuticals . Other components of pomegranate, punicalagins, were also found to inhibit same enzymes, thus adding to the overall whitening effect . Solubility: 1,3 propanediol+alkaline solvent. Note: this is difficult to dissolve, due to the Ellagic acid content. We use heating and a high speed homogenizer for 6 hours to achieve full solubility. We suggest you buy our pre-dissolved solution! 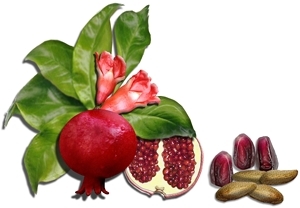 J. S. Jurenka, “Therapeutic applications of pomegranate (Punica granatum L.): a review,” Altern. Med. Rev. J. Clin. Ther., vol. 13, no. 2, pp. 128–144, Jun. 2008. M. K. Reddy, S. K. Gupta, M. R. Jacob, S. I. Khan, and D. Ferreira, “Antioxidant, antimalarial and antimicrobial activities of tannin-rich fractions, ellagitannins and phenolic acids from Punica granatum L,” Planta Med., vol. 73, no. 5, pp. 461–467, May 2007. S. Rout and R. Banerjee, “Free radical scavenging, anti-glycation and tyrosinase inhibition properties of a polysaccharide fraction isolated from the rind from Punica granatum,” Bioresour. Technol., vol. 98, no. 16, pp. 3159–3163, Nov. 2007. M. A. Zaid, F. Afaq, D. N. Syed, M. Dreher, and H. Mukhtar, “Inhibition of UVB-mediated oxidative stress and markers of photoaging in immortalized HaCaT keratinocytes by pomegranate polyphenol extract POMx,” Photochem. Photobiol., vol. 83, no. 4, pp. 882–888, Aug. 2007. J. Mo, P. Panichayupakaranant, N. Kaewnopparat, S. Songkro, and W. Reanmongkol, “Topical anti-inflammatory potential of standardized pomegranate rind extract and ellagic acid in contact dermatitis,” Phytother. Res. PTR, vol. 28, no. 4, pp. 629–632, Apr. 2014. R. Parveen, N. Akhtar, and T. Mahmood, “Topical microemulsion containing Punica granatum extract: its control over skin erythema and melanin in healthy Asian subjects,” Adv. Dermatol. Allergol. Dermatol. Alergol., vol. 31, no. 6, pp. 351–355, Dec. 2014. F. Afaq, M. A. Zaid, N. Khan, M. Dreher, and H. Mukhtar, “Protective effect of pomegranate-derived products on UVB-mediated damage in human reconstituted skin,” Exp. Dermatol., vol. 18, no. 6, pp. 553–561, Jun. 2009. L. A. Pacheco-Palencia, G. Noratto, L. Hingorani, S. T. Talcott, and S. U. Mertens-Talcott, “Protective effects of standardized pomegranate (Punica granatum L.) polyphenolic extract in ultraviolet-irradiated human skin fibroblasts,” J. Agric. Food Chem., vol. 56, no. 18, pp. 8434–8441, Sep. 2008. M. N. Aslam, E. P. Lansky, and J. Varani, “Pomegranate as a cosmeceutical source: pomegranate fractions promote proliferation and procollagen synthesis and inhibit matrix metalloproteinase-1 production in human skin cells,” J. Ethnopharmacol., vol. 103, no. 3, pp. 311–318, Feb. 2006. I. Ertam, B. Mutlu, I. Unal, S. Alper, B. Kivçak, and O. Ozer, “Efficiency of ellagic acid and arbutin in melasma: a randomized, prospective, open-label study,” J. Dermatol., vol. 35, no. 9, pp. 570–574, Sep. 2008. A. Dahl, M. Yatskayer, S. Raab, and C. Oresajo, “Tolerance and efficacy of a product containing ellagic and salicylic acids in reducing hyperpigmentation and dark spots in comparison with 4% hydroquinone,” J. Drugs Dermatol. JDD, vol. 12, no. 1, pp. 52–58, Jan. 2013. J. Rana, G. Diwakar, L. Saito, J. D. Scholten, and T. Mulder, “Inhibition of melanin content by Punicalagins in the super fruit pomegranate (Punica granatum),” J. Cosmet. Sci., vol. 64, no. 6, pp. 445–453, Dec. 2013. S. B. Nayak, V. Rodrigues, S. Maharaj, and V. S. Bhogadi, “Wound healing activity of the fruit skin of Punica granatum,” J. Med. Food, vol. 16, no. 9, pp. 857–861, Sep. 2013. K. N. C. Murthy, V. K. Reddy, J. M. Veigas, and U. D. Murthy, “Study on wound healing activity of Punica granatum peel,” J. Med. Food, vol. 7, no. 2, pp. 256–259, 2004. J. Mo, P. Panichayupakaranant, N. Kaewnopparat, A. Nitiruangjaras, and W. Reanmongkol, “Wound healing activities of standardized pomegranate rind extract and its major antioxidant ellagic acid in rat dermal wounds,” J. Nat. Med., vol. 68, no. 2, pp. 377–386, Apr. 2014. E. A. Hayouni, K. Miled, S. Boubaker, Z. Bellasfar, M. Abedrabba, H. Iwaski, H. Oku, T. Matsui, F. Limam, and M. Hamdi, “Hydroalcoholic extract based-ointment from Punica granatum L. peels with enhanced in vivo healing potential on dermal wounds,” Phytomedicine Int. J. Phytother. Phytopharm., vol. 18, no. 11, pp. 976–984, Aug. 2011.